Today is the Long Beach Grand Prix and although I’m very aware this blog is about small business, I’ll freely admit that this post is personal. Read it if you’re interested in these minor race details from a local observer. 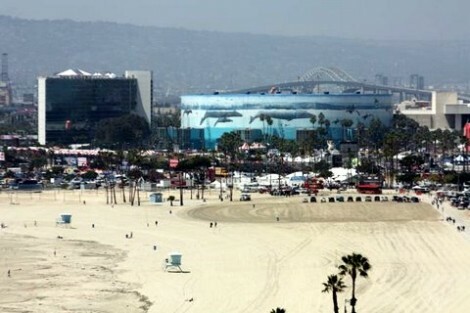 The building to the left is the Hyatt Hotel, near the Long Beach Convention Center. The Hyatt overlooks the majority of the race circuit. Note the tent on the roof of the hotel where they charge bucketloads of money to watch the race – not to mention the great view from the rooms facing the course. The grandstands are set up below the hotel and Aquarium – I know it’s not easy to see at this size. Anyone who doesn’t know Long Beach is probably not aware that they close down and use public roads for that race in a very busy and popular area near downtown called “The Pike” which used to be (long ago) an amusement park on the beach, beside where the Queen Mary is now permanently docked. 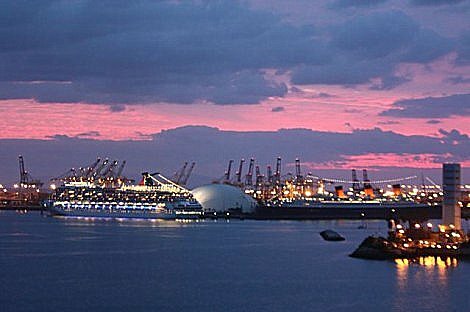 Here’s a view of Carnival Cruise lines (left) and the Queen Mary (right) seen in a recent shot at dusk. 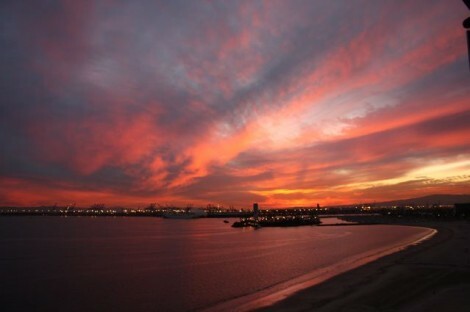 I can see the Queen Mary across Alamitos Bay from the balcony of my place in a high-rise condo on the beach. Every Year the Long Beach Grand Prix runs for three days and I hear the sound of CART IndyCars for the weekend. Yesterday I was doing a bit of online work and had the sliding door to the balcony open, hearing practice sessions as cars started laps. Even from a mile away the sound is pretty loud. But I’d gotten used to hearing the cars as they took laps around the 2.02 mile track. During a lull between the Indy Car practice and the Toyota Pro Celebrity Race, I heard a booming roar that was nothing like the race cars. 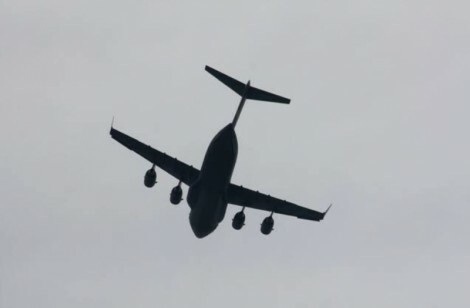 I stepped onto the balcony to see a monstrous C-17 Cargo jet, flying at what appeared to be waaaay to slow to keep it in the air without falling. Clearly meant to be an impressive display for the crowds below at the race. Here’s how it looked as it passed over my head. 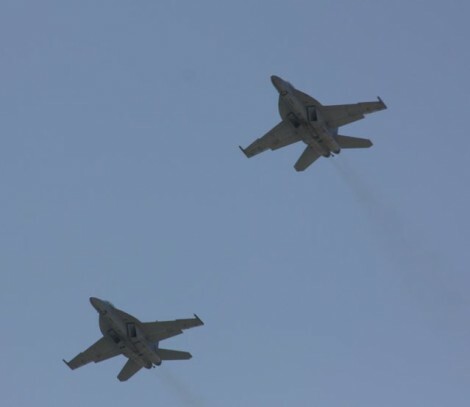 I must have said several times, “Wow!, That thing is going way to slow to stay in the sky!” It’s like seeing a cruise ship overhead and sounds as loud as a freight train. I rarely do personal posts here, but hope you enjoyed a day at the races, even if it isn’t the typical close-up stuff. I’ll leave you with a stunning sunrise I saw as I was leaving for work recently – I commute for about an hour and each time I wonder why I do that, I just remember some of the cool stuff I’ve shown here. By the way – the winner? From the official Grand Prix of Long Beach web site. Ryan Hunter-Reay led 64 of 85 laps – relatively unchallenged – and won the 36th Annual Toyota Grand Prix of Long Beach IZOD IndyCar Series race today. It was Hunter-Reay’s second series race win and first in 2010. Hunter-Reay took the checkered flag 5.6031 seconds ahead of runner-up Justin Wilson, with polesitter Will Power filling out the podium. Scott Dixon was fourth and Tony Kanaan fifth.